I heard it this weekend at the start line of my 10K. "My first 10K, I was so disappointed. I ran it in 1 hour 35 seconds - I really wanted to be under an hour." "Here we go, off for an hour of running." 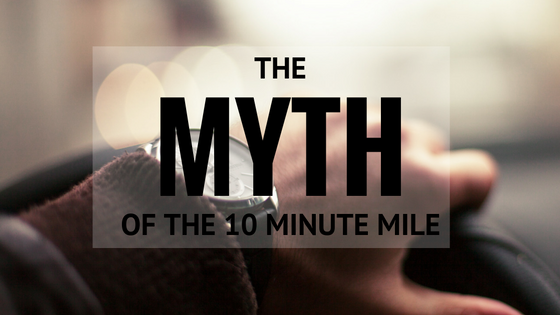 The myth of the 10 minute mile is everywhere. The assumption that a 10 minute mile is an average, or standard pace, particularly for a beginner. "Got 20 minutes? You can run 2 miles." "I just want to be able to run this 10K in under an hour." "I'm slow - I can't run a 5K in under 30 minutes." Hell, even Couch to 5K - which I swear by - only gets you to run for 30 minutes, which is not, by most beginner standards, enough time to run a 5K. It took me over 18 months of running to be able to run a 10 minute mile. It took even longer - almost two years - to be able to run a 30 minute 5K and then, a few weeks later, a 60 minute 10K. Which, let's not forget, is actually a 9:39 minute mile. A 10 minute mile is decent, and 60 minute 10K is very good. It's not average. In fact, the average female finish time of a 10K is 1:04:47 according to this research. Plus a 5K at a 9:39 minute mile pace is completely different to a 10K - twice the distance - at the same pace. I get it, we like round numbers, but this myth is setting runners up for disappointment, and I've been there. The myth of the 10 minute mile was so ingrained in me when I first started running that I thought I was running half a mile if I ran for 5 minutes. The reality is, when I first started running, I was running about a 13 minute mile. And that's okay, but it's hard to not feel disappointed when everything suggests a 10 minute mile is a standard beginner pace. But I had no point of reference except the myth of the 10 minute mile. You don't hear about people running 11, 12, 13 minute miles. I learned this even more when I got a Runners' World subscription. I love the magazine, but it doesn't cater very fairly for those that run anywhere below average. The myth of the 10 minute mile made me feel bad about myself for a really long time. It made me feel like I wasn't a "real" runner. It made me preface every race time with "I'm really slow, but...". It made me feel guilty every single time I went for a run and saw 11s and 12s on my mile times. So let's reject the 10 minute mile as the standard beginner pace. Let's embrace 11 and 12 and 13 minute miles. Let's encourage running at all paces. Let's stop calling ourselves slow and let's stop assuming that one pace fits all. Let's celebrate when we hit that 10 minute mile pace, not expect it.